There were a lot of little updates on the 3DS today. For those who had not heard, Nintendo held a conference to announce a lot of news regarding their 3DS handheld. 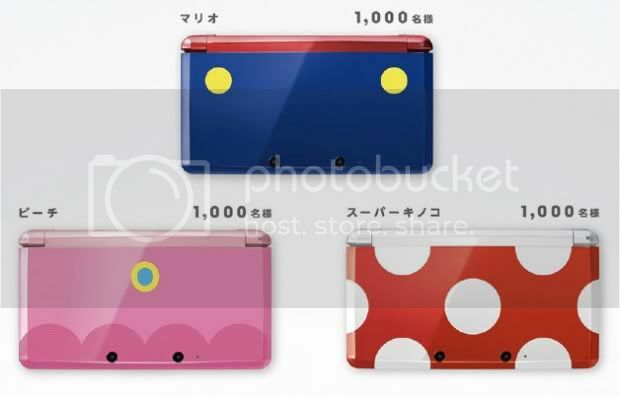 First, we have a few 3DS models stylized after Super Mario characters. Next, a couple of games were announced as part of the 3D Classics series, which is old-school titles released on the eShop, supposedly with 3D enhancements. The UK is getting Kirby's Adventure and Japan Kid Icarus. They have not said whether these will later be available elsewhere. Other announcements included the addition of Hulu Plus and free messaging via the 3DS. It is good to see that Nintendo is coming through now and really supporting their system. It was looking pretty grim for a while there between the severe lack of strong launch titles and news that Nintendo shareholders were pressuring Iwata. The 3DS definitely has a lot of potential behind it. It seems like Nintendo is being a lot more aggressive in their promotion of it. My guess is that more 3DS systems will be selling this holiday season than Wii consoles. Which, of course, brings up the question: now that the Wii U has been announced, will there be much life left for the Wii once people finish off Skyward Sword? Personally, I'm looking forward more to Kirby's Return to Dream Land, but that's me. Still, I would be glad if Operation Rainfall succeeded in getting a western release for Last Story by Final Fantasy director Hironobu Sakaguchi. That would definitely give the Wii some more longevity in the meantime. At least, if rumors that the Wii U is having development issues, Nintendo has to come back with more support for their current console. People who remain Wii owners are more likely to move onto the Wii U, while people who abandon the system for a Playstation 3 or Xbox 360 will be more difficult to win back later. Visit My Nintendo News for further details.